Stage 5 of the TOUR introduced the second KOM of the event. 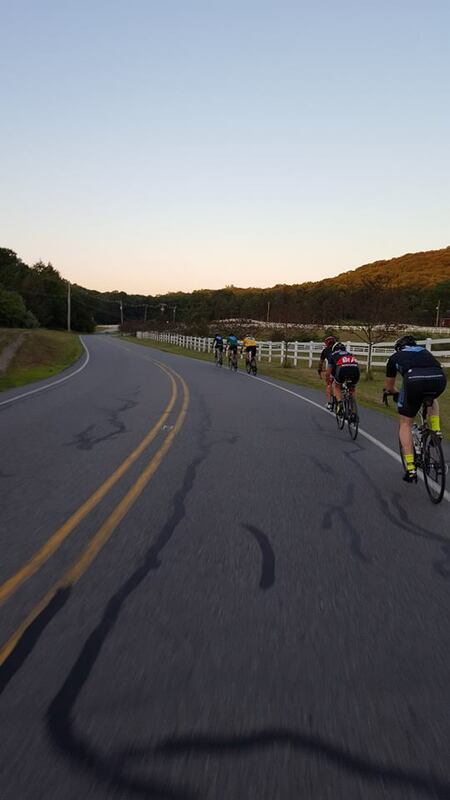 Conditions were absolutely perfect for the ride, low 80s and minimal humidity. Iwaszczuk won the stage and opened nice lead in GC for yellow jersey. Coronel is in 2nd and Findlater is 3rd overall. 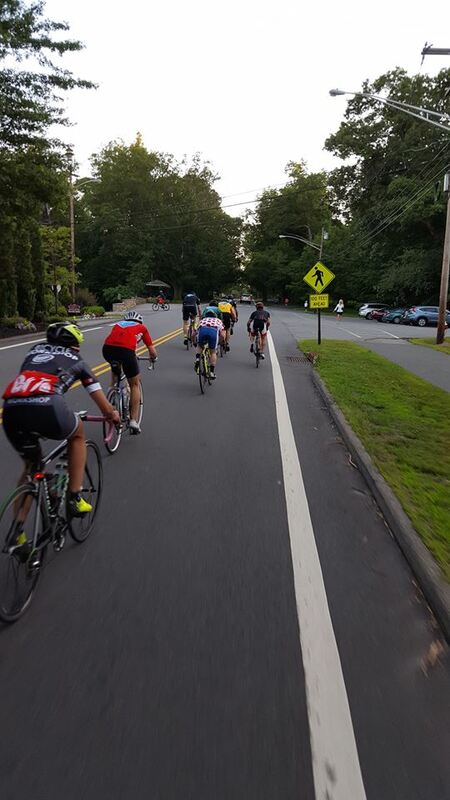 The pack made good time as it wound through Riverdale and Pompton Lakes, crossing Route 23 with a perfect green light and rolling swiftly into Pompton Plains. The group climbed up into Montville and the Taylortown KOM began after the Route 287 overpass traffic light. Nick Morell immediately dropped the hammer. He accelerated up the slopes, helium in his wheels. His velocity was impressive. “The harder you climb, the faster it is done,” Morell said. Nick Morell dropping the bomb early on Taylortown KOM and powering away early on the early slopes of the climb. Behind, yellow jersey Iwaszczuk gave chase. He rode the climb smart, maintaining a big enough lead for 2nd. Like a great fishermen, the yellow jersey lets the riders go, then slowly reels them in. Location: bottom-third of Taylortown KOM. The battle for 3rd was intense, with Jason Pilato, Bladdy Coronel, Chris Labudde, and Gabrielle Czernik all throwing down against one another, making for a fast ascent. Pilato powered away, clearly pushing himself into 3rd on the road. Czernik was gapped midway, Labudde was off the front, pedaling hard, not coming back. Coronel is riding at a high level right now. He rode with Czernik, then dropped her, bridged to Labudde, then gapped him at the top, cleanly taking 3rd. Ferocious performance. Coronel making contact with LaBudde near top of Taylortown KOM, Czernik chasing and closing. The group rode smoothly as it meandered up towards the rad plateau that is Boonton Township and Mountain Lakes. 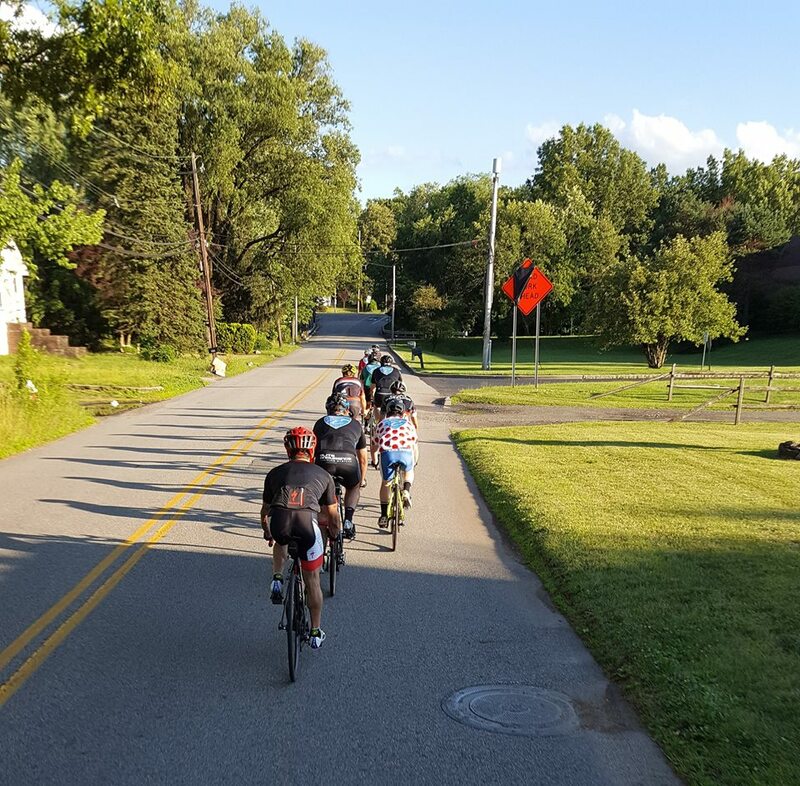 The group barreled down the wide Boulevard towards the second points section of the night. Iwaszczuk jumped first and jumped best — peoooooooo. 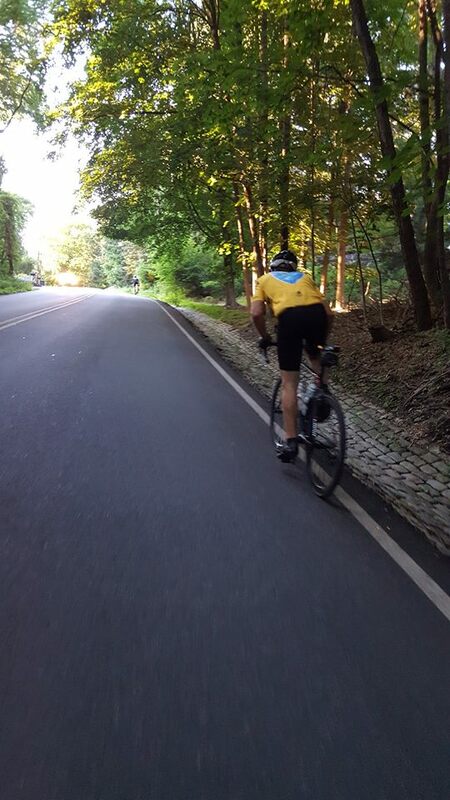 When you ride in the yellow jersey, you ride from the front, displaying your strength. Strongest rider wears yellow, very commonly this is the case, and it’s no different with Iwaszczuk. The roller that is the first part of the Mountain Lakes sprint. The finish is downhill, on the other side. 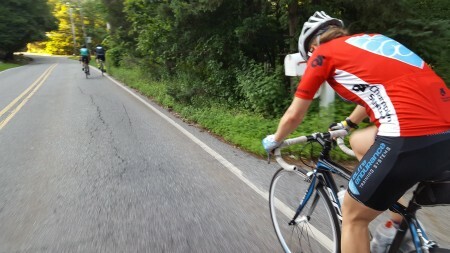 Note the superior position of the yellow jersey. The yellow jersey won this sprint section. Iwaszczuk knew when to time his effort — he jumped near the crest of the roller, powered down the slope with a gap and came across the line with a huge lead. Green jersey Coronel pipped Morell at the line for 2nd. In the finishing section in Kinnelon, Iwaszczuk continued with his aggression, attacking on the first hill. The pace sapped Czernik and Pilato. Coronel was able to keep a steady pace, finding himself alone after the first series of climbs. Pilato put his head down and chased Coronel down like a dog, dragging Czernik with him. A mile from the finish, the three came together and it was going to be a sprint for the finish. Coronel has the most experience of the group and it showed — as they lined up for the sprint, Coronel timed his acceleration just right as he instantly gapped his riding companions and held his acceleration to the line. 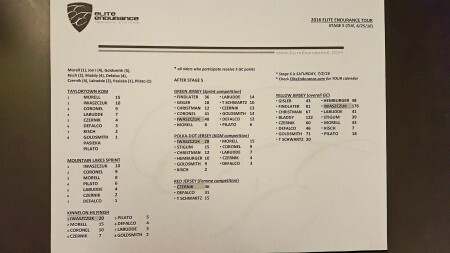 Czernik finished 4th, Pilato 5th. 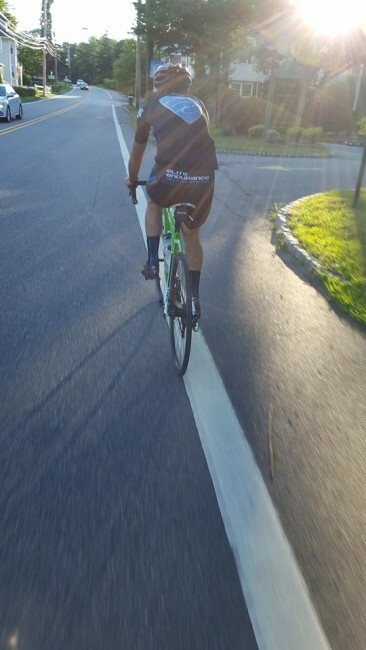 Labudde flatted before the Kinnelon section and was able to repair it and finish not far behind the group. He has never ridden stronger. “Good training,” Labudde said, smiling wryly after making contact again before the group descended through Kinnelon and Butler. 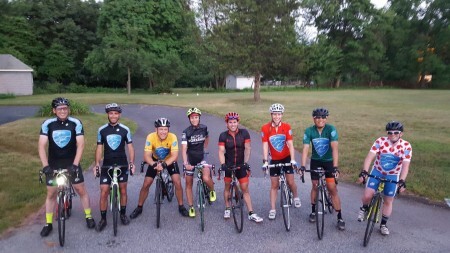 Defalco, the 2015 winner of the Femme jersey, recently won the Cat-2 Lewis Morris MTB race and has experienced improved form through the TOUR. The nice part about the TOUR is the stages finish at heaven. 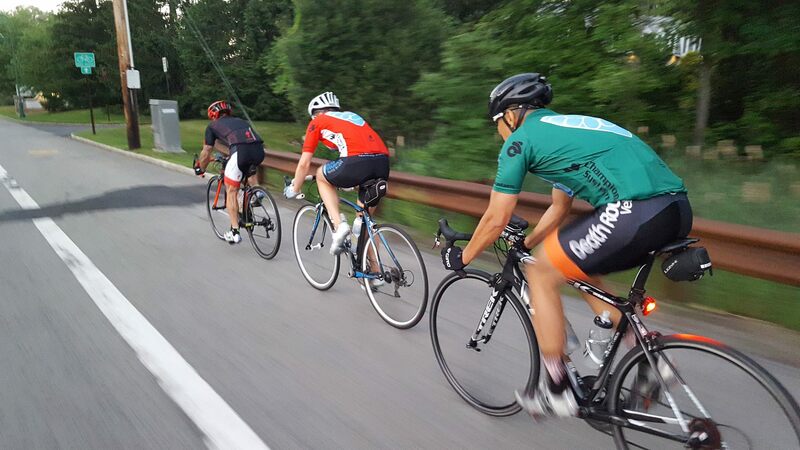 The 6th Stage is Saturday, wheels down 8am from Riverdale NJ. Ride time will be 3h, a true parade of the terrain. The TOUR is free and awesome and open to all experienced riders. Riders can start at any stage; the points keep adding up. For parking and directions, contact Coach@EliteEndurance.com.